Get ready for the ultimate thrill in Karachi! Mountain Dew is bringing something exciting to your city on 15th April, 2018! We guarantee it will sweep you off your feet! Watch out for a lot of revs and tire tracks as grand superbikes start making rounds in your city! 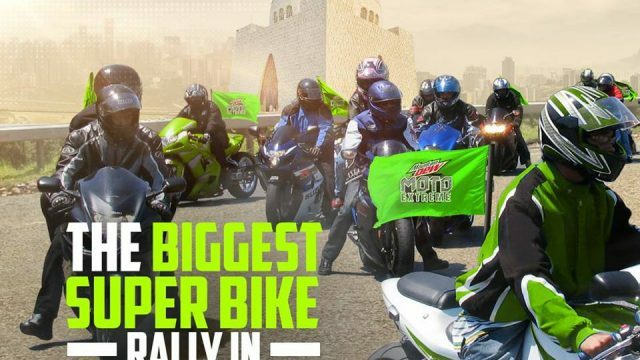 These professional bikers will ride out in a procession and you will see some EXTREME Mountain Dew action. Catch the action at 5 p.m. as our bikers ride from Shahrah-e-Faisal to Teen Talwar and on to Seaview! We’re only days away from the highly awaited Dew Moto Extreme event. It’s Pakistan’s biggest stunt show and it’s coming soon to your city! Mountain Dew athletes are going to take center stage, or should we say center ramp, and they will pull off some daredevil EXTREME stunts! Whether it’s mid-air somersault action you crave or you simply want to see flying bikes, Dew Moto Extreme will have it all! The high-speed superbikes are a little teaser of what’s still to come from Mountain Dew. Note the neon-green flags on each superbike: Mountain Dew never cuts back on thrill! There has been a lot of suspense as everyone is waiting for Dew Moto Extreme to land. We have a few days left until the ramps are set up and then it’s ON! Are you excited for #DewMotoExtreme? Tell us in the comments below!